When it comes to using promotional products to draw attention to your cpmpany or organization, an excellent item to consider are these unique 16 oz. Acrylic Tumblers with Straws. These 16 oz. 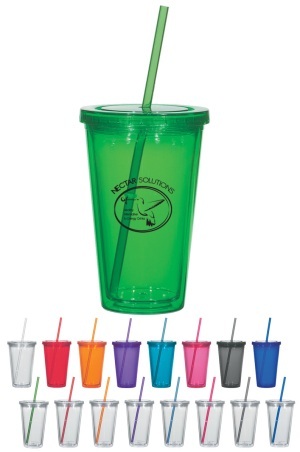 Double Wall Acrylic Tumblers with Straws are the perfect item to use for promotional purposes because of their perceived value and quality features. From afar, these 16 oz. Acrylic Tumblers with Straws look like disposable drinkware items, but they are in fact reusable and incredibly stylish. They come in many colors. These acrylic tumblers hold up to sixteen ounces of liquid storage which is often considered the perfect portion. Translucent: blue, charcoal, clear, green, orange, purple or red - all with matching colored straw. Translucent: clear with blue, charcoal, green, clear or red straw. These ink colors are our standard colors. If a PMS Color match is requested, add $50.00 per PMS color. PMS Color Match cannot be guaranteed. Your Drinkware Printer thanks you for visiting our website! Be sure to check back for updates.